With 58 public health nurses walking off the job Tuesday morning, the Thunder Bay District Health Unit has suspended more than a dozen programs including its flu clinics. The nurses, represented by the Ontario Nurses Association (ONA), have been without a contract for two years and rejected the health unit’s final contract offer Monday night after days of negotiations, including conciliation and mediation. Public health nurse and member of ONA Local 014 Shelley Aretz said they want respectful negotiations with their employers. “We want them to be at the table without us going without a contract for two years,” she said. “We’re looking to have pay equity with male counterparts within the health unit and reach parity with other public health nurses.” Aretz said the nurses at the Thunder Bay District Health Unit are the lowest paid public health nurses in Ontario. During the strike, the following programs will be suspended: nurse practitioner clinics, street nursing, immunization and travel health clinics, flu clinics, smoking cessation clinics, breastfeeding clinics, prenatal classes, parenting sessions and workshops, Healthy Babies Healthy Children, workplace health program, dental hygiene clinics for low-risk children, branch office nursing clinics and some school health programming. Sexual health clinics will be running, but at limited capacity and service delays are expected. See the full story in the print and digital editions of The Chronicle-Journal. 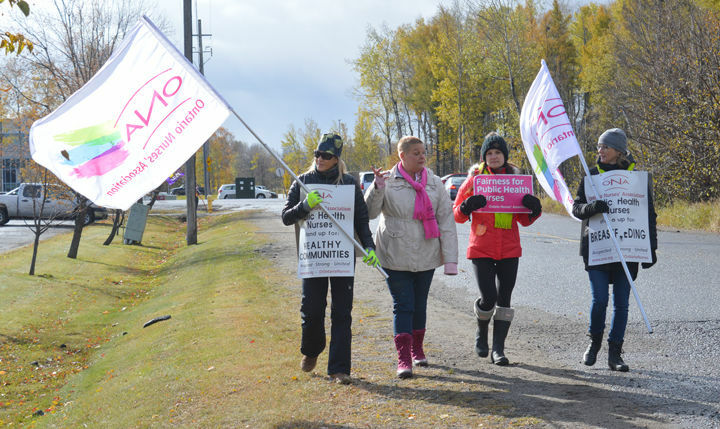 Public health nurses walk the picket line outside the Thunder Bay District Health Unit on Tuesday. With 58 public health nurses walking off the job Tuesday morning, the Thunder Bay District Health Unit has suspended more than a dozen programs including its flu clinics. The nurses, represented by the Ontario Nurses Association (ONA), have been without a contract for two years and rejected the health unit’s final contract offer Monday night after days of negotiations, including conciliation and mediation.